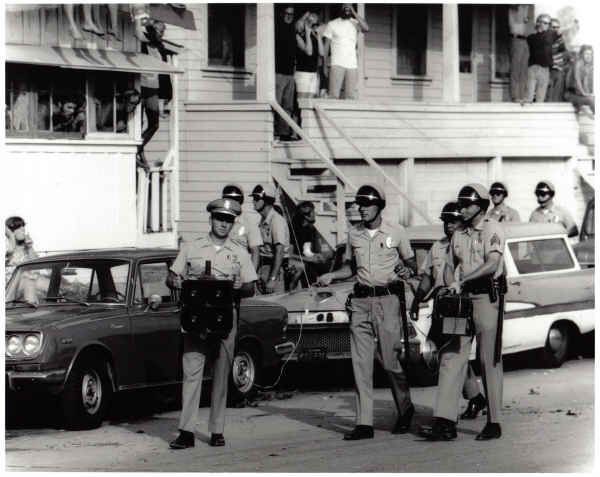 Labor Day ‘Riot’, 1968: youth on Long Branch Ave spark outburst that is answered by police and crowd-control efforts. Here everyone comes out to watch order being restored. The OB Temple is the building in the left-center of photo. Gormlie is the most far right person standing on the porch of building on the right center of the photo. Editor: This is part of a irregular continuing series about Ocean Beach since the late Sixties and the early history of the first OB Rag. OB was already well-known for its rowdy and irreverent culture of beach, surf & beer; but by 1968, it began its transformation into something more. Bleach blond long-haired surfers lived next door to long-haired hippies, and soon you couldn’t tell them apart. It became official: Ocean Beach had become the hippie mecca. 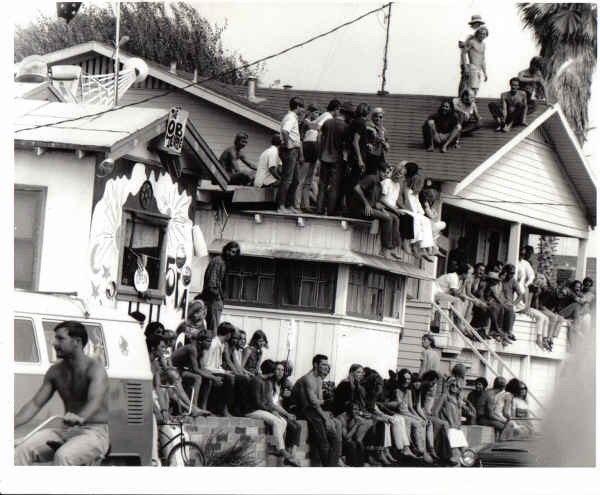 Since the late sixties, Ocean Beach had morphed into the hippie hangout for the entire city. OB had become the Haight-Ashbury of San Diego, shadowing the more famous early birthplace of hippie-ism. But if you were young and a hippie in San Diego, you ended up in OB. Before it was a hippie town, Ocean Beach was a college beach town, filled with students and surfers. Typical of such summer-oriented youthful beach towns — little more than sand arenas of beer-energized crowds on those the hot days, there was an innate rebelliousness. It was like the atmosphere of a constant spring break hanging in the air. Over the springs and summers near the end of the decade, there had been a number of rowdy confrontations with police officers — usually on a hot day — usually beginning near the foot of Newport, when water balloons — careening through the crowds — got out of hand. The cops would arrive, and then they would become the targets. There had been the famous Easter Riots. The Labor Day riot. 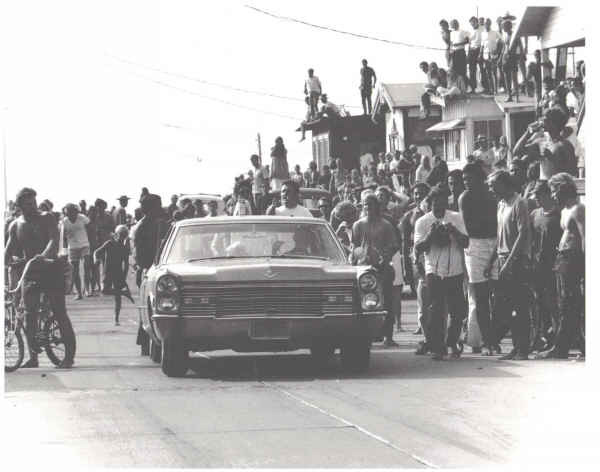 On Labor Day, 1968, the skirmishing between police and locals became so intense and out of control, that the soon-to-be police chief himself, Ray Hoobler, – then a lieutenant, arrived to personally address the youthful crowds and direct house-to-house searches, as his officers sought those sandy scofflaws responsible for the rebellion. 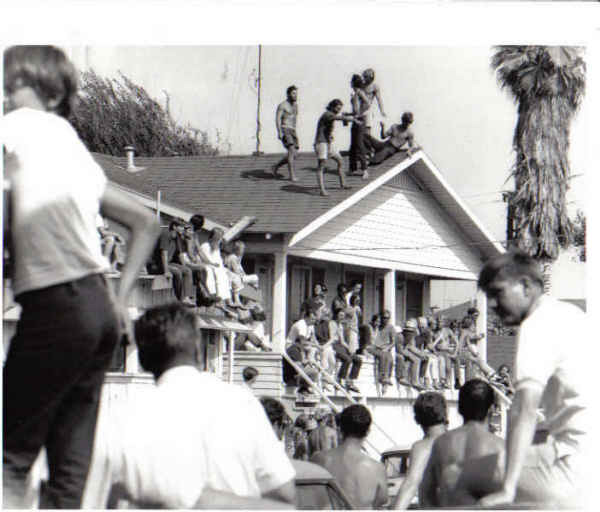 According to locals, the riot on Labor Day started on the last block of Long Branch when young surfers on rooftops started throwing water balloons and cherry bombs at neighbors and passerbys. It escalated between neighbors, a few cops drove by, then somebody complained, and then the troops were sent in. Hundreds of kids crowded the sidewalks, rooftops, balconies, porches along the last block Long Branch Avenue as police tried to clear the streets and bring order to the beach. Steve Rowell is guy wearing white shirt and holding a camera to the right of the vehicle. Labor Day 1968 was one of them. The Jetty Fight during the summer of 1970 was another. They were signs that OB was a budding insurgent community. Ocean Beach, then, for Frank Gormlie – first editor and publisher of the OB Rag – presented itself as one of those college communities where the new politics were sprouting. OB had no college itself, but its beach cottages and apartments were filled with students from State, UCSD, Cal-Western not far away. OB was a college town without a college. He likened it to those other insurgent neighborhoods like Isla Vista, Berkeley, Ann Arbor, where, with idealism perhaps stronger than realism, there were real efforts being manifested in creating alternative social-structures within those communities, alternatives to establishment values and institutions. Tom Hayden, the well-known activist, had written of such insurgent communities. He advocated radicals establishing “beachheads” of progressive politics within the college towns that surrounded the exploding college campuses. Gormlie read him and took him literally. OB was going to be one of these beachheads. Community organizing was where it was at, he thought. This was where he was coming from, when he convinced his close friend and fellow UCSD radical, John Lyons to move to OB and in his discussions with Bo Blakey, the third member of the first OB Rag core, over what to do politically — once they settled in at the Etiwanda house. Gormlie had been inspired by San Diego’s early ‘underground’ or alternative newspapers, particularly the San Diego Street Journal. The Street Journal, originally the San Diego Free Press, had been organized by a collective of students and grad students from UCSD. Upon the assassination of Martin Luther King in April of 1968, this collective had formed, had moved off campus “to be more relevant”, and began publishing the Free Press out of an old beat-up, two-storied Victorian house between Hillcrest and downtown. They changed their name to the Street Journal, and took on the establishment — and made history. The Street Journal’s campaign against C. Arnholt Smith – Mr. San Diego of 1960 – a major kingpin in local banking and power circles – was instrumental in helping to bring his corrupt empire down. But all this was yet to come. Gormlie saw the potential of a newspaper as a wonderful organizing tool. There were days when Gormlie felt that journalism was in his blood. He had led renditions of student newspapers during his grade school days, he had written an article or two for UCSD’s radical student newspaper, but he had no formal journalistic training. Having found himself to be an activist at heart at college, this tug of war between his journalistic side and his activist side would plague him for decades. But in the summer of 1970, Gormlie wanted some kind of vehicle, some kind of “in” for his anticipated community organizing. He also understood the power of words — having been a good writer throughout his academic career, and he understood that the power to define events was potentially earthshaking. There was a tradition in this country – starting with Ben Franklin – of the little newspaper standing up and criticizing the rulers. Now, inspired by the Street Journal, Gormlie wanted to do an underground newspaper. It seemed like an excellent idea. The Rag’s vibrant and brilliant young staffs, energized and wise before their age, were knowledgeable and on top of the most important and significant issues facing Ocean Beach in those days. On the international and national level, the War, of course, was the big issue. Locally, the threat of gentrification and over-development (”Miami Beachization”), more than any other immediate and OB issue was consistently challenged by the Rag. The Precise Plan – the urban plan that would have drastically transformed the community and in the process, uprooted much of the poor and youth within the population, was met head-on by the Rag. In conjunction with local environmentalists, the Rag helped lead the creation of a successful alternative to the plan. The paper led on many other issues, as well: the lack of adequate childcare, organic food, sexism within the community and within the counter-culture, community control of the police, the list goes on…. Often staff members were leaders in their own right in many of the various organizations and alternative institutions that were being created and developed within the community. Over time, the Rag, in reflecting the trials and tribulations of the community, did give voice to the new sub-culture with its distinctive left-wing irreverent attitude. It blended news and activism and became an outlet for journalistic, artistic, poetic and organizing talents. Importantly, it connected Ocean Beach politically with the rest of the world and it tried, at first very raw, to bring the best politics to OB. It was local and internationalist at the same time. Not only did the OB Rag reflect the new counter-culture and its adherents within the community, not only did it provide an outlet for homegrown voices of left-wing populism and solidarity, and not only did it lead the seaside neighborhood in many issues, it was responding to a critical need of a sub-culture that was bursting through the seams of the traditional culture, and all the while, being suppressed by the mainstream culture. It needed a voice, a sympathetic voice. For more of the early OB Rag history and historical events of the Seventies, go here. as one of those “sandy scofflaws” i resembled that remark back then. great job! Wow, I moved here in 1976 and soon plugged in and became an activist and learned that so much had preceded me. It’s hard in such a mobile community to get that history except through oral tradition and newspapers. I was lucky enough to have had possession of a number of OB Rags for awhile — I eventually donated them to the OB Library — and lucky enough to know Frank well or so I thought until I read of events here in 1968. I had tried to archive older events in 1980 in the Save Red House campaign and, believe me, it was difficult to find anything before 1972 that was at all activist in nature. In 1980-1985, I lived about 3 doors east of the Longbranch Ave. cottages shown above. Thanks so much and keep up the great work. Maybe more of the Haight-Ashbury-cultural beachhead could be covered in another article with more emphasis on the blossoming of the counterculture here beyond the politics and police. Long live news and activism! Note in the 2nd photo from the top, the police are carrying something. Ironically, they have a machine that was supposed to be a crowd-control device by emitting high-pitched sounds. One person in the pic has their hands over their ears. I say ironically, because the police are still experimenting with devices such as this. At the Spring Valley town hall meeting with Congresswoman Susan Davis, the Sheriffs had a sonic device – ready to use. Plus just last week, police forces in Pittsburgh at the G-20 summit and protests used another type of sonic crowd-control weapon. Did nato decide blasting Justin Bieber was too cruel? Coincidentally(? )/Not surprisingly/Interestingly . . . the old Austin Rag has also borne a blog, The Rag Blog by name, also started by some of the old Rag people from Austin in the 60s whom I had the great and good fortune to know THEN, 6-7 years before I came to OB and became part of the OBPeople’sRag, even more a great and good fortune . . . my connection to them was through the student movement and SDS, a big student organization of the day . . . The Rag Blog is more of a news and culture blog than a community blog, but has pretty interesting content whenever I check it out. They are apparently starting Rag Radio, a regular show on a local FM station as well. This OB narrative is still so fascinating to me, Frank, and you write good history. Nostalgia yes, but I really believe knowing history gives you some insight into present time. Like Robert Burns I moved to O.B. in 1976. I was always intrigued and enamored with the “60’s” activist and the stories of their exploits. Many of those early activist were leaving O.B. by the mid-seventies. I was on the Planning Board with Robert when he tried to save the “Red House” and heard many of the stories of the olden days over beers at Pac Shores. These awesome narratives about the old days are what pulled me into the site a couple years ago when I was haphazardly cruising the web looking for a new apartment…thanks for re-posting Frank! I know a lot of the current audience wasn’t around back then when they were front page news the first go-round. I’m still waiting for the saga to continue, you’ve left a couple decades’ gap in the story and your impassioned writing is epic. Chris, the funny thing about this photo and the event was that I had totally forgotten that I was there. Not until just recently (last year) did I realize it after observing this photo very carefully. Wow! What a mind meld. And you’re right … it’s also proof that I was skinny once. Groovy site! Anyone know of some “Hippy” lifestyle cities in US or canada? Omg…just realized my friend lives in the old OB Temple house! SO cool! We have holiday parties there all the time….keeping the groovy times going baby! Peace out! Arrived OB in’67. Turned 21 there in ’69. Barely escaped in ’70. Still have and hold the beautiful woman I met there. I don’t remember much… but it was a wonderful time to be young and crazy. I do remember Spaceman, Indian Tony, Black Tony, Hobbit (me), Acid Dan, Sailor Mike, Susie Q, Dodie, Ahnalie, and… you know, we were a Tribe.